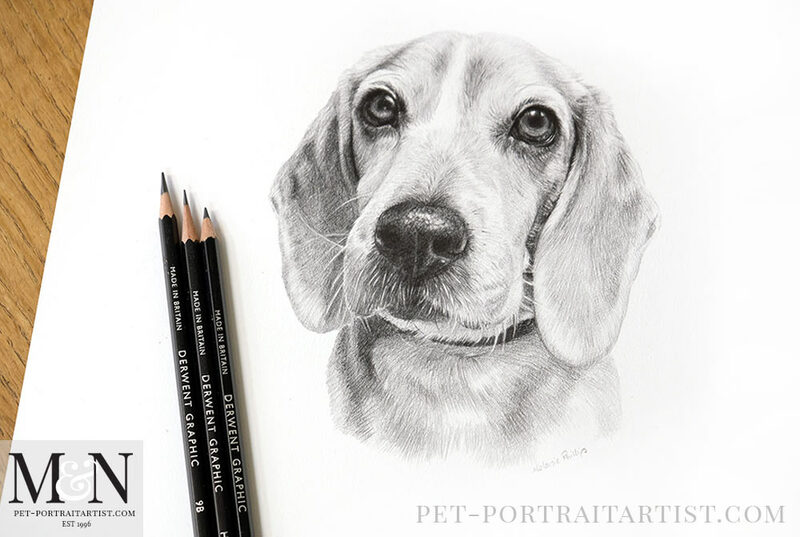 Welcome to my latest portrait and yes it’s another beagle pet portrait! I love that my clients rescue dogs, it warms my heart to know that they are now in a loving home and safe environment. That is just what happened for Blue in the last couple of months for returning client Ben and his family. 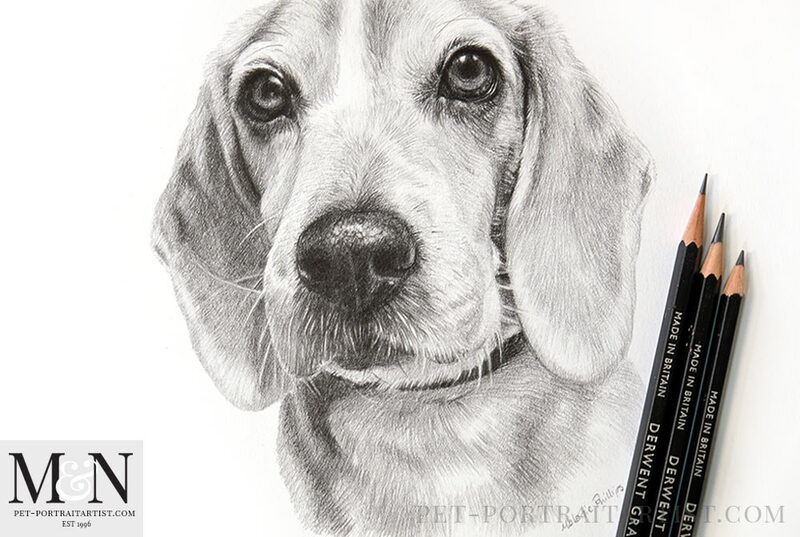 If readers visited our blog last month they will remember the lovely portrait of Frannie. I created it as a surprise birthday gift commissioned by Ben to give to his wife Marissa on her birthday. 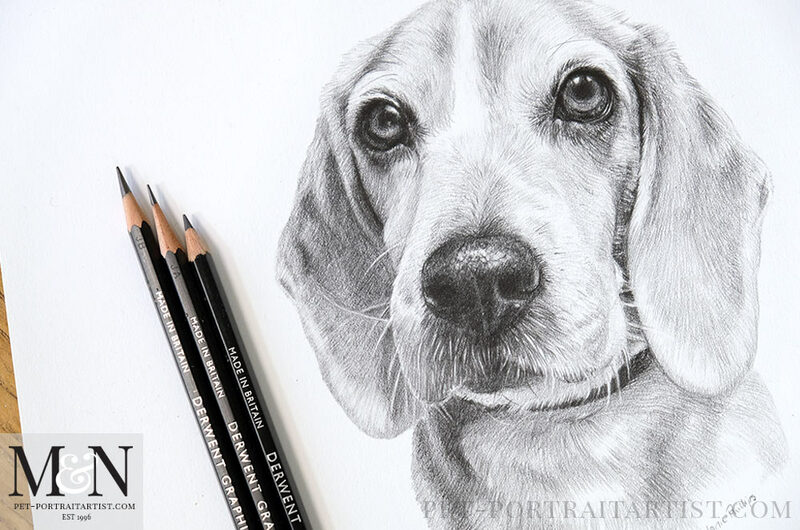 You can see the drawing on our blog of Frannie the Beagle. While I was drawing Frannie, Ben knew that they were just about to rescue another Beagle called Blue. It was so exciting and Ben felt that it would be a wonderful idea to have a portrait of him for Marissa as a surprise for Christmas. So we quickly booked Blue in and Ben proceeded to take photos for the portrait. Blue has such soulful eyes and I thoroughly enjoyed drawing him. You can see a final photo, some candid shots and a lovely email from Ben below too. 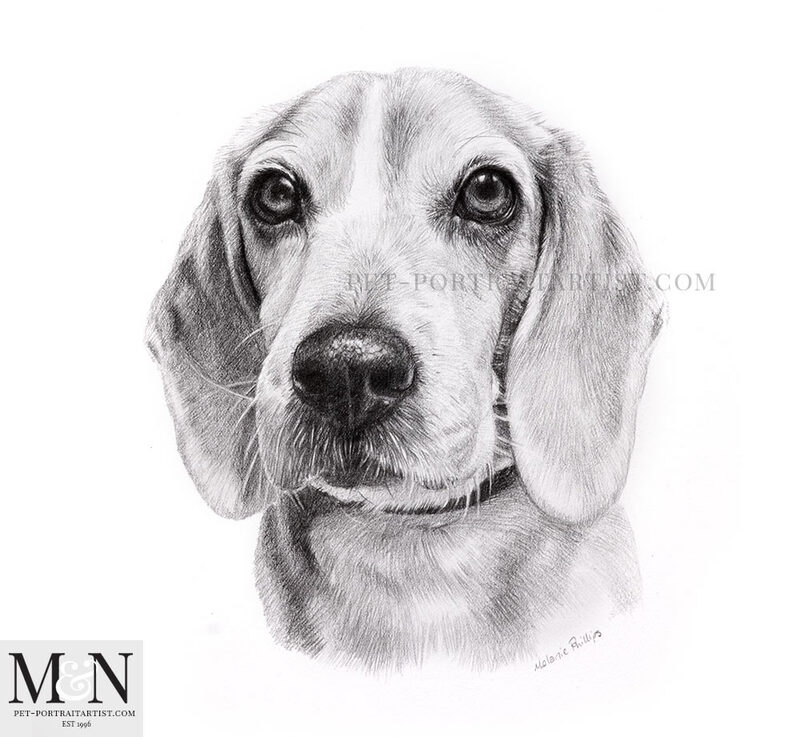 The drawing was a 12 x 10 and Ben emailed two wonderful testimonials below! Marisa was SO surprised and THRILLED with her drawing of Blue! She agrees that it captures him brilliantly. I will send pictures when he is framed and hung with honor by his family. But until then, please know how very much your work is appreciated. She was showing snapshots of the drawing to family all day yesterday and it was amazing seeing their reactions. “Oh those eyes,” “wow even the flash on his nose,” that sort of thing. You have an amazing gift. Thank you for sharing it with us. Best wishes, talk to you soon! I took some candid photos for Ben to see to go along with the final photo and you can see them below. I have also added a wonderful testimonial from Ben which I hope that you enjoy reading. You’re right, you really captured his eyes so well. Blue is somewhat more subdued (although more and more goofy the more comfortable he gets!) and very soulful, you’re right about that. He is settling in still but doing well and has found his little beagle bay, when he gets startled. For a little dude he has a big voice when he wants! Typical beagle… but he’s SO cute and sweet. And he is a great snuggler with his new mom & dad and he LOVES his 2 puppy sisters. 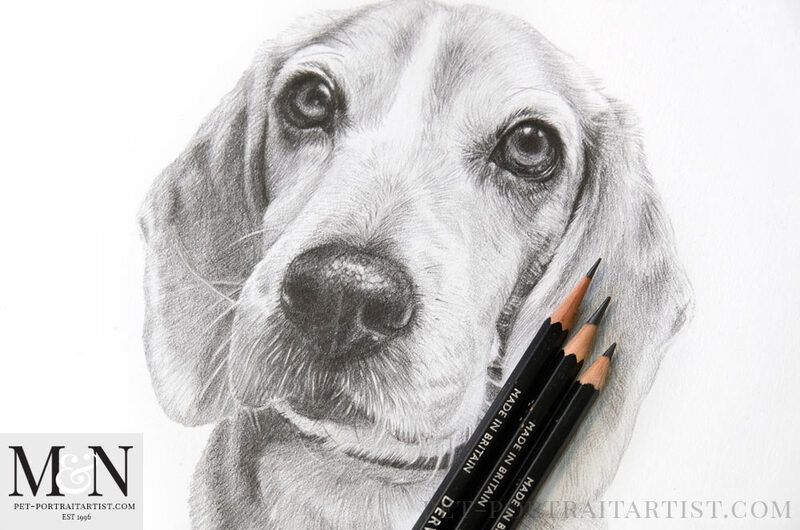 The drawing looks a little lighter on the attached picture, except for his eyes and nose. I was gonna ask if that was a trick of the light but then again he IS lighter in person, a little whiter in the face. But then those dark eyes stand out. And the details like the whiter streak up his nose and his whiter whiskers really stand out. Seriously, well done by you. Thanks again, SO much. I honestly love it.